If you’ve ridden a two-stroke, you’ll know how addictive the power rush (and sound) can be. So we have a soft spot for anything that smells pungent and goes braaap—especially if it’s got a bit of history and a side order of style. 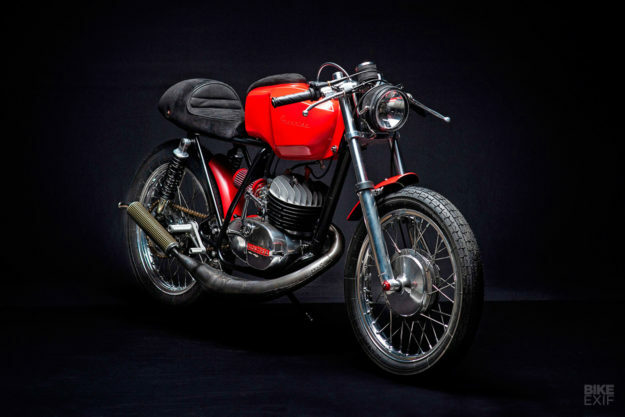 Montesa bikes tick all the boxes: the Spanish manufacturer was hugely successful in motocross and road racing from the sixties to the mid-eighties. 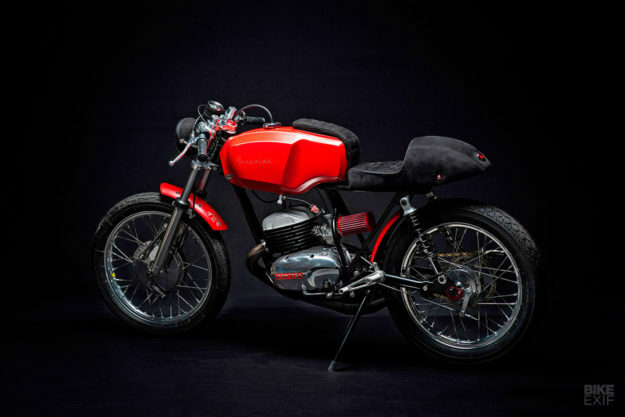 Its Cota 247 model was also popular with trials riders—but who’d have thought a trials bike would make a great little café racer? 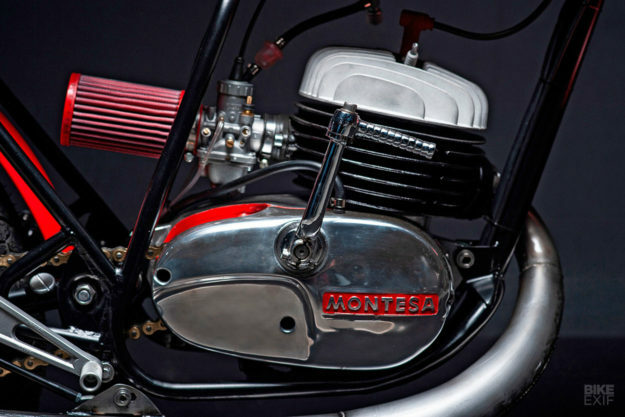 Pierre specializes in the repair and maintenance of classic bikes, and prepping machines for vintage racing series. 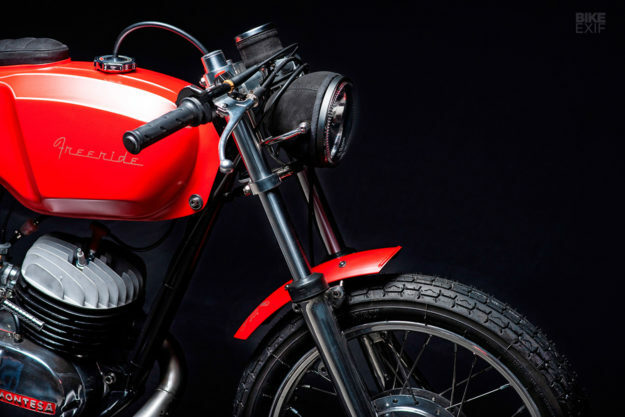 But he’s also very good at creating sharp-looking, quirky customs—like the Honda CX650 scrambler we featured a few months ago. It’s one hell of a transformation. At just 192 pounds (87 kilos) dry, the original Cota 247 is a nimble handler so weight reduction was not a priority. Pierre has given it a full reconditioning, with new bearings and seals, and even a new crankshaft. He’s also tweaked the stock exhaust system and intake, and fitted a big bore piston kit from Italkit. The original Amal carb has been upgraded to a Mikuni VM26 with a free-flowing BMC filter, and there’s now a Powerdynamo electronic ignition to keep the timing nice and regular. 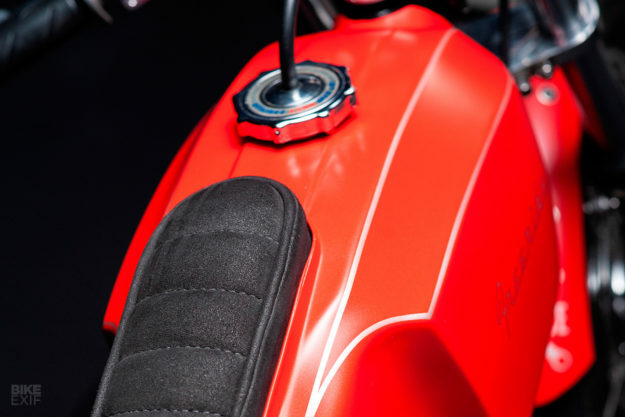 Right above is the fuel tank from a Malaguti Olympic, a 50cc moped from the 1970s. It’s an inspired choice: in this context, the chiseled lines look amazingly contemporary and completely change the vibe of the Cota. 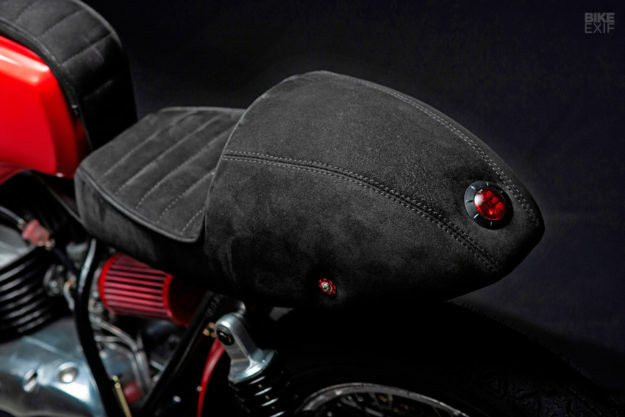 The new rear cowl is covered in a racy black suede that extends over the seat pan, applied by Kabuki Sellerie. We haven’t heard of that French shop before, but they obviously know what they’re doing. So Pierre has overhauled and cut down the original Betor forks. 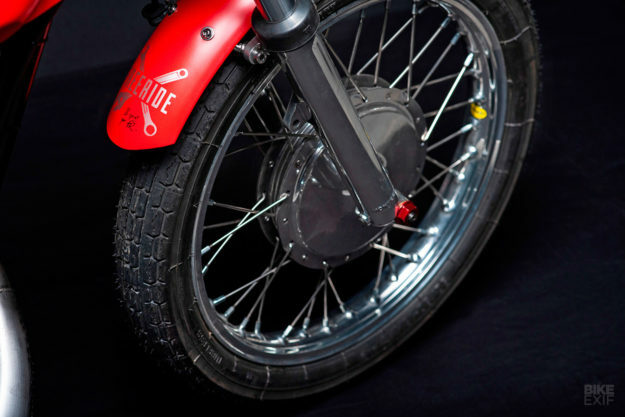 Now fitted with shorter springs, they’re hooked up to 18-inch period-correct Akront wheels using a hub from a 1960s Montesa Impala street bike. There’s a matching Akront out back, cushioned by new YSS shocks. 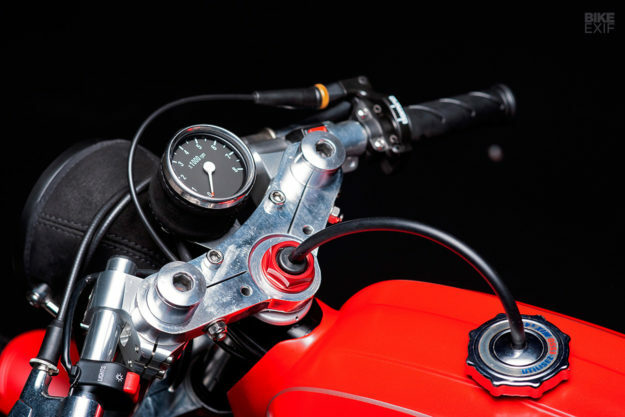 Converting a trials bike to a café racer involves a multitude of smaller details too. 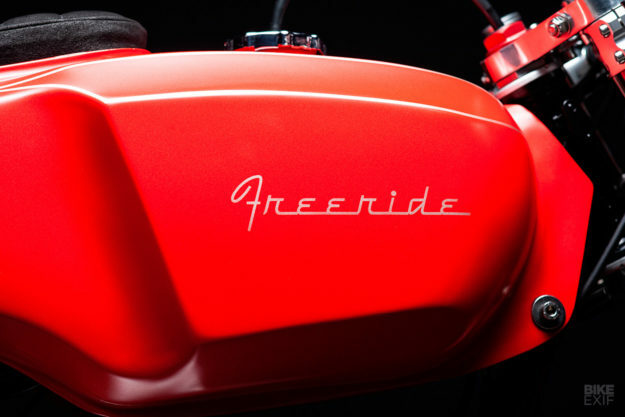 Pierre has created dozens of small parts—including new mounts for the tank, seat and repositioned footpegs—and adapted Tarozzi aluminum linkages for the foot controls. He’s built new clip-ons too, adapting them to the stock Cota 247 top yoke, and installed a Domino throttle and Amal brake and clutch levers. 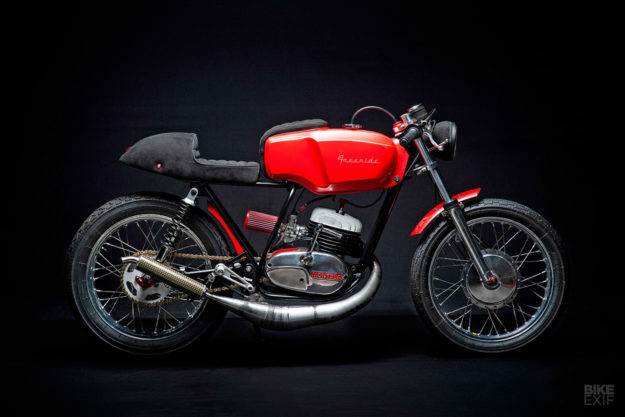 The little Montesa is now ready to hit the streets. And we don’t know whether to applaud the new owner for his unusual choice of steed, or feel slightly jealous. 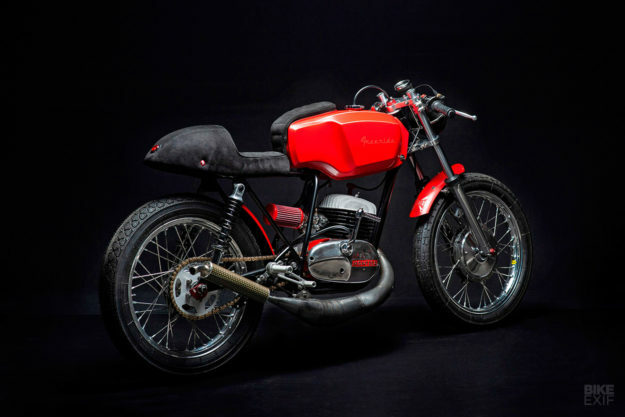 This pocket-sized café racer is unlikely to break any lap records at Paul Ricard, but it’ll rule the roost at the traffic light Grand Prix. More of this braaaple sauce, please!